Introduction: Good oral health is a key to overall health and wellbeing. It is essential and safe and can prevent long-term health issues. The role of oral health professionals includes providing preventive services and restorative treatment along with anticipatory guidance for pregnant women and their children. Aim: The objective of the study was to assess the knowledge, attitude, and practice among dental interns and final-year students in treating pregnant women. Materials and Methods: A questionnaire study was conducted in a private dental college in Mangalore city which included 140 students. A study-specific questionnaire was prepared to collect the data. Descriptive analysis was done. Statistical analysis was done with the help of the Statistical Package for Social Sciences version 17 (SPSS Inc., IBM, Chicago, IL, USA). Results: On average, there was enough knowledge among students regarding oral health. Nearly 39.3% of students had sufficient knowledge regarding management of pregnant women in a dental chair, and the students considered textbooks (49%) and lecture (25%) as their prime source of knowledge. About 39.3% of the clinical students educated the pregnant patients regarding their oral health and its influence on the fetus. About 42.1% educated occasionally and 18.6% never took pain to bring awareness among pregnant ladies. Regarding the antibiotic and analgesic of choice for pregnant women, very few had other options other than amoxicillin (77.1%) and paracetamol (73.6%). Single prescription over polypharmacy was supported by 77.7% students. Conclusion: The finding underscores the knowledge and information of dental students in the fundamentals of dental management of pregnant women to be satisfactory. Improvement is needed to increase the awareness of clinical students toward different types of critical treatment. Overall health is directly related to good oral hygiene. It is necessary to maintain good oral health in both mother and child to prevent long-term health issues. Pregnancy increases women's risk for oral infections, and proper perinatal caring reduces child's susceptibility to possible risks in future. Researchers provide some association between periodontal diseases and birth outcome. Despite this, an overwhelming number of pregnant women refuse seeking dental care. Pregnancy is not a reason to defer routine dental care or treatment. However, this kind of outlook may be either due to decreased interest or lack of communication between the obstetrician and the patient or due to dentist's disbeliefs to some misconceptions or lack of knowledge regarding the safety procedures during dental treatment. Delay in necessary treatment could cause unforeseen harm to the mother and possibly to the fetus. The role of oral health professionals includes providing preventive services and restorative treatment along with anticipatory guidance for pregnant women and their children. As early as 1928, the importance of prenatal dental care has been recognized. However, dentists were warned to treat pregnant women only if an emergency condition was present. According to various studies, nearly 35%–44% of women do not receive oral health care while pregnant. Less than one-third (30%) of women visited dentist during pregnancy and even after the birth of the child. Among pregnant women who report having oral problems, only about half seek oral health care. Low level of dental awareness in different socioeconomic groups may arise due to the lack of dental programs addressed to people at different ages. Many developed countries have implemented strategies to try to improve pregnant women's oral health, which have included utilizing prenatal care providers to improve maternal oral health (USA) and offering pregnant women free access to public dental services (UK and Greece). However, in India, there is a lack of emphasis on perinatal oral health due to misconceptions, fear of lawsuits, or lack of evidence-based information among dentists. Long waiting time in the government clinic ranked the first perceived barrier against having a dental checkup during pregnancy. Improving the oral health of pregnant women prevents complications of dental diseases during pregnancy and may reduce preterm and low birth weight deliveries. Pregnant women's health significantly influences the future of a child's health. Only when pregnant women's health issues are given a higher priority by health-care providers (i.e., public and private insurers), there will be substantial improvement in the oral and general health of the next generation. It is the duty of dentists to break the taboo of wrong belief that dental treatment should not be undertaken during pregnancy. Pregnant woman should be advised that the prevention, diagnosis, and treatment of oral diseases are highly beneficial. For that, we should be aware of pregnancy-associated lesions and the treatment available. Thus, the present study was planned to assess the awareness among dental interns and final-year students in managing dental cases of pregnant women in Mangalore. A questionnaire study was conducted in a private dental college in Mangalore city, Karnataka. Dental interns and final-year clinical students who were present in the college were included in the study. One hundred and forty students were present on the day and participated in this study. A convenience sampling was done. A written consent was obtained before the survey. Ethical clearance was obtained from the college (AJEC/REV/93/2018). A study-specific questionnaire was prepared to collect the data. Demographic details were included in the questionnaire along with the questions pertaining to dental awareness, attitudes, practices, and how to deal with them. Questionnaire was designed to contain 20 questions in 2 pages [Table 1]. The questionnaire was extracted from a previously published article. It contained questions regarding knowledge, attitude, and practices. Content validity was checked by subject expert, and reliability of the questionnaire is 0.8. The participants were administered the questions in the college premises, and filled questionnaire was collected from the students in a week time. After collecting the questionnaire, each student was briefed about the important aspects of oral hygiene and its relation to systemic health. Descriptive analysis was done. Statistical analysis was done with the help of statistical package for social sciences version 17 (SPSS Inc., IBM, and Chicago, IL, USA). Only proportions were considered and no comparison was done in this study. Out of the 140 clinical students who took part in the study, 74 were interns and 66 were final-year students. 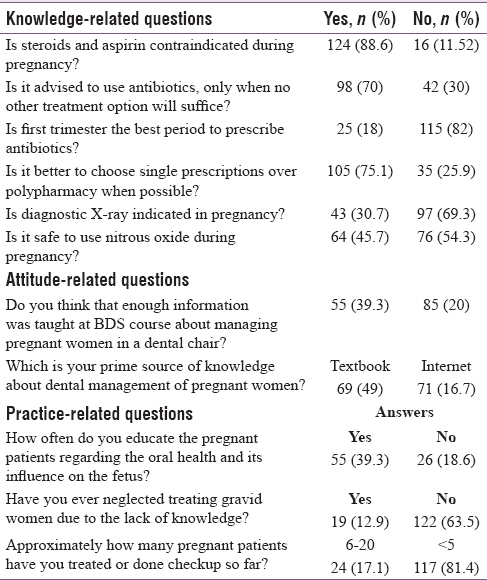 When considering practice-related questions, in order to understand their outlook towards the management of pregnant women, a question was put up “have you ever neglected treating pregnant women due to lack of knowledge?” Fortunately, most of the study participants said no (63.5%), few hesitated to answer (can't say – 23.6%), and a very few (12.9%) answered yes. About 39.3% of the clinical students educate pregnant patients regarding their oral health and its influence on the fetus. About 42.1% educated occasionally and 18.6% never took pain to bring awareness among pregnant ladies. Out of 140 students, 17.1% have treated between 6 and 20 pregnant patients, 81.4% have treated <5 patients, and just 1.4% of clinical students have treated more than 20 gravid women. When we questioned them about their knowledge regarding managing pregnant women in a dental chair was sufficient, 39.3% answered yes, 20% said no, and 40.7% replied very little. The students considered textbooks (49%) and lecture (25%) as their prime source of knowledge about dental management of pregnant women. Nearly 16.7% depended on internet whereas very few (5%) thought that brochures and videos (4.3%) would be useful. Regarding their knowledge about the suitable period for treating dental problems in pregnant women, about 87.9% of the students answered as the second trimester, and among them, 72.9% replied the reason as the first trimester is the period of organogenesis and high chances of abortion occur during that period and the third trimester can lead to preterm birth which points out the second trimester to be the best period for treatment. Regarding the antibiotic and analgesic of choice for pregnant women, very few had other options than amoxicillin (77.1%) and paracetamol (73.6%). About 82.1% of the clinical students prefer treating a pregnant patient in the left lateral decubitus position, whereas very few (5.0%) considered 90 degree the right position and few (12.9%) answered supine as the correct treatment position. Most of the clinical students have encountered gingival diseases (76.4%) as the most common oral disease in pregnant women. Few thought periodontitis (12.1%) and dental caries (10.7%) as the most prevalent oral disease. Only very few (0.7%) said erosion. When asked about naming any two antibiotics contraindicated during pregnancy, more than half the percentage (70%) came forward with tetracycline and thalidomide. Chloramphenicol, ciprofloxacin, erythromycin, aminoglycosides, sulfonamides, and cephalosporins are the other drug names contributed. The present study was done to assess awareness among dental interns and final-year students in managing dental cases of pregnant women in Mangalore. When asked about the knowledge provided in the BDS curriculum in treating pregnant women on dental chair, majority felt as very little, which has to be seriously taken into account. This parallels with the study conducted by Aljulayfi et al. in Saudi Arabia. The gaps in knowledge and practice of oral and dental health care among the dental students should require more intense classes and instructions. Moreover, the students considered textbooks and lectures as their prime source of knowledge about dental management of pregnant women, which highlights the necessity of creating awareness among clinical students in their academic syllabus itself. Regarding most common oral disease, our study shows that about 76% of the participants agreed that gingivitis is the most common oral manifestation in pregnant women. Another study had registered that about 81% of participants agreed that pregnancy increases the tendency to have gingival inflammation. Most of the students agreed aspirin and steroids to be contraindicated in pregnancy. Majority (78.9%) of the students thought that antibiotics should be prescribed only as a last resort when no other treatment option would suffice and 72% came forward suggesting the first trimester as the best period for prescribing antibiotics. Single prescription over polypharmacy was supported by 77.7% students. In a study done in Connecticut, there was a lack of consensus about medications, dentists reported acceptable to prescribe for pregnant patients, and female dentists were significantly less likely than males to prescribe ibuprofen. At least half of the respondents reported not being completely comfortable treating pregnant patients. Further, many dentists appear to not follow medication prescribing guidelines for this population. When compared to other similar studies, knowledge of clinical students seems to be satisfied. There definitely were limitations in this study including the study sample that mostly reflects the final-year students and interns of a particular college, where the sample size is less and is confined to an area. More students from neighboring colleges could have been included. In the present study, there was a large variance in knowledge and widespread confusion related to some specific practices such as using antibiotics and recommended positioning. Continued education is necessary in managing pregnant patients in clinical settings. Women should be highly advised and motivated by the dentist to implement recommended health practices but need information in a timely, accessible, consistent manner. Oral health professionals should render all needed dental services to pregnant women. It is also important that dental clinicians need to remain vigilant in recognizing and preferably preventing adverse drug interactions in their patients. Dentists who perceived higher levels of barriers are likely to have incorrect assumptions about the appropriateness of routine and emergency oral health care during pregnancy. The scope of future research is higher in this field, especially when there is still no evidence that the mercury released from existing amalgam fillings harms the fetus or not and the role of fluoride on water and pros and cons of dietary supplements during pregnancy, which is also a pressing issue. This study has provided valuable insight into the current scenario among budding dental practitioners and their awareness in treating pregnant patients. Reviewing their awareness, an acceptable knowledge in some areas is observed, but they still need to have more training and education during their under and postgraduate life to improve their knowledge of how to handle pregnant dental patients. We would like to thank Dr. Vijaya Hegde, Dr. Shreshtha Shetty, Dr. Punith Shetty and Dr. Akhilesh M Wodeyar for their guidance and support. Ngeow WC, Chai WL. Understanding the dental need and care during pregnancy: A review. Med J Malaysia 1999;54:146-50. Gaszyńska E, Klepacz-Szewczyk J, Trafalska E, Garus-Pakowska A, Szatko F. Dental awareness and oral health of pregnant women in Poland. Int J Occup Med Environ Health 2015;28:603-11. California Dental Association Foundation, American College of Obstetricians and Gynecologists, District IX. Oral health during pregnancy and early childhood: Evidence-based guidelines for health professionals. J Calif Dent Assoc 2010;38:391-403, 405-40. May L, Suminski RR, Yeung AY, Linklater ER, Christensen C, Jahnke S. Pregnant patient knowledge of and obstetric provider advice on oral health. J Dent Oral Disord Ther 2014;2:1-6. Bamanikar S, Kee LK. Knowledge, attitude and practice of oral and dental healthcare in pregnant women. Oman Med J 2013;28:288-91. Soysa N, Alles N. A pilot study on attitudes, knowledge and behaviour towards dental diseases among grade medical officers in the Kandy district, Sri Lanka. J Dent 2016;4:9-16. Irvine J, Holve S, Krol D, Schroth R. Early childhood caries in indigenous communities: A Joint Statement with the American Academy of Pediatrics. Paediatr Child Health 2011;16:351-64. Alves RT, Ribeiro RA, Costa LR, Leles CR, Freire Mdo C, Paiva SM, et al. Oral care during pregnancy: Attitudes of Brazilian public health professionals. Int J Environ Res Public Health 2012;9:3454-64. Boggess KA, Edelstein BL. Oral health in women during preconception and pregnancy: Implications for birth outcomes and infant oral health. Matern Child Health J 2006;10:S169-74. Aljulayfi I, Alrusayni A, Alqahtani S, Hamam MK. Awareness of dental interns in managing cases of pregnant women in Saudi Arabia. Saudi J Dent Res 2015;6:26-9. Pina PM, Douglass J. Practices and opinions of connecticut general dentists regarding dental treatment during pregnancy. Gen Dent 2011;59:e25-31. Lee RS, Milgrom P, Huebner CE, Conrad DA. Dentists' perceptions of barriers to providing dental care to pregnant women. Womens Health Issues 2010;20:359-65.